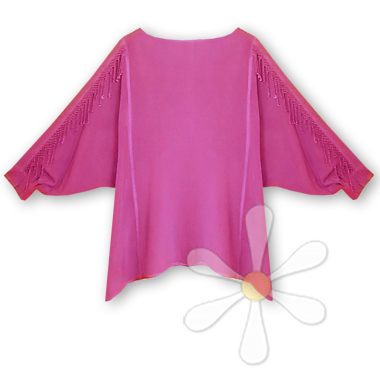 This fringy top is a sensation! it has a rounded neckline, a basic tunic shape, but o! those sleeves! Gorgeous fringe that's twisted and knotted by hand falls from a trapunto-stitched runner from the shoulders to the cuff bands, which are also decorated with trapunto. Can you spell f-a-b-u-l-o-u-s? You're the artist, be your own canvas... express who you are, every day. Why not?